A good friend of mine was over today and we chatted about how far we had come since childhood. Her, shortly, to become a lawyer, and myself…an author? I laughed at the notion and avoided saying it aloud when she asked me to. So I beg the question. What makes you an author in 2014? I am going the self-published route and in my mind that means I’m not an author. I know that’s not right but that’s how I view it. The last 3 years of writing, the editing, the days at Starbucks, don’t make me an author in my eyes. I haven’t self-published yet but even when I do I still don’t think I’ll consider myself an author. Sadly, the main reason I feel that way is because I’m not being published the traditional route. In my mind I still need that third-party (aside from myself and my friends) to say yes, check mark, job well done, you can call yourself an author now. Isn’t that disheartening? Or is it? Lawyers have the bar, Doctors have schools and exams to tell them they are designated – even a white coat ceremony. And authors have big money-making publishing houses tell them aw yes, you are an author. However, self-publishing and the Internet are changing that for writers. What about bloggers, aren’t they writers and even authors themselves? One could go so far as to call social media strategists, speech writers and brand managers, writers and therefore authors. Let’s see what the dictionary says, another “official” source. 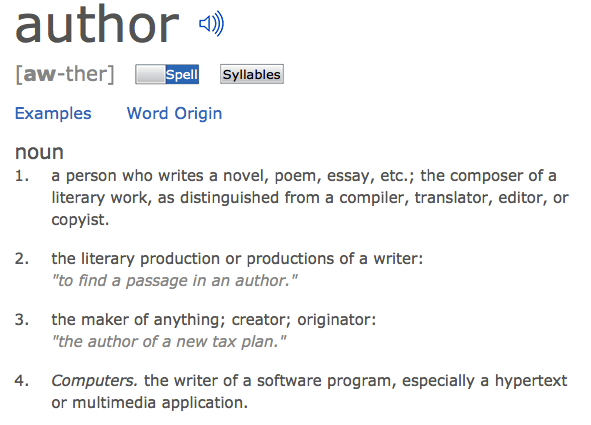 From this definition, it’s the creation really that makes you an author. Having created. I write there for I am. You can’t just wake up one day, without written material, and say hey, I’m an author. But having written one am I now an author? Even before self-publishing would it be right to call myself an author? I guess, once I’ve sold a book or two and been given positive feedback from randoms who don’t know me, then I can say I’m an author? Right? I felt the same way at first about selfpub.. Google who selfpubbed and you’ll really be surprised. Hemingway for one….